Welcome to Acorn Custom Sports Framing! My passion is sports - my hobby is framing. Please take time to view the various framing styles I have created. Don't forget to click on "Next Page" at bottom to see ALL of the frame photos I have posted. Stay tuned as I will be updating website with new frame photos (8 X 10, 16 X 20) very soon. 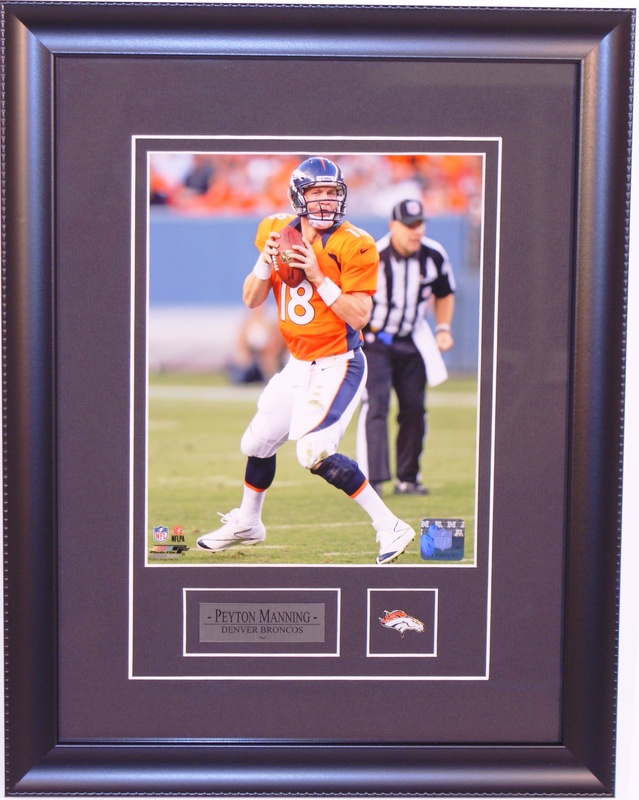 8 X 10 Photo frame of Peyton Manning – Denver Broncos. After spending 14 seasons with the Indianpolis Colts, “MVP” Manning signed with the Denver Broncos in 2012 after recovering from successful neck surgery. On September 9th, 2012, Manning threw his 400th TD pass. Plate reads: “Peyton Manning – Denver Broncos”. Authentic Broncos team logo pin attached. Please contact for pricing. 8 X 10 Photo frame of Teemu Selanne – Winnipeg Jets. Teemu Selanne was selected 10th overall in the 1988 NHL Entry Draft and in 1992, started his NHL career with the Winnipeg Jets and wore #13 the first year (second choice to #8 which was worn by Randy Carlyle. “The Finnish Flash” went on to set NHL rookie records with 76 goals and 132 points and won the Calder Memorial Trophy. Plate reads: “Teemu Selanne – Winnipeg Jets – 1992-1996”. Authentic Jets primary logo pin attached. Please contact for pricing. 8 X 10 Double photo frame – Winnipeg Jets. On October 9, 2011, the Winnipeg Jets returned to Winnipeg, Manitoba after leaving 15 years prior. The top left photo shows the Inaugural game faceoff vs Montreal. The bottom right photo shows Nik Antropov scoring the Winnipeg Jets FIRST goal against Carey Price. Space is reserved for two “Game Used” Winnipeg Jets tickets. Plates read: “First Game” and “First Goal”. Authentic Winnipeg Jets “Inaugual Season” and Secondary Logo team pins attached. Please ask for pricing. 8 X 10 Double photo frame – Winnipeg Jets. On October 9, 2011, the Winnipeg Jets returned to Winnipeg, Manitoba after leaving 15 years prior. Left photo shows the Inaugural game faceoff vs Montreal. The right photo shows Nik Antropov scoring the Winnipeg Jets FIRST goal against Carey Price. Space is reserved for your “Game Used” Winnipeg Jets ticket. Winnipeg Jets “Inaugural Season” team pin attached. Please ask for pricing. 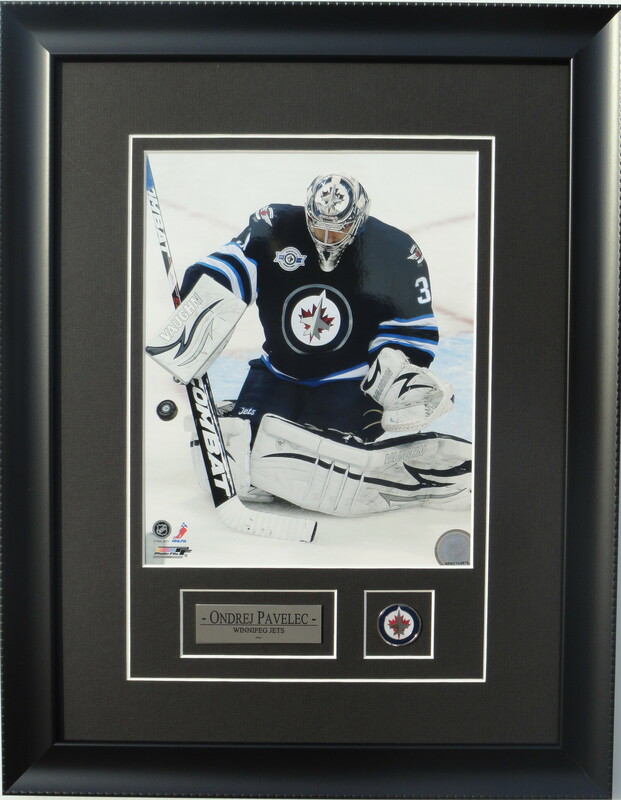 8 X 10 Photo frame of Ondrej Pavelec – Winnipeg Jets. Plate reads: “Ondrej Pavelec – Winnipeg Jets”. Authentic Winnipeg Jets primary team logo pin attached. Please contact for pricing. 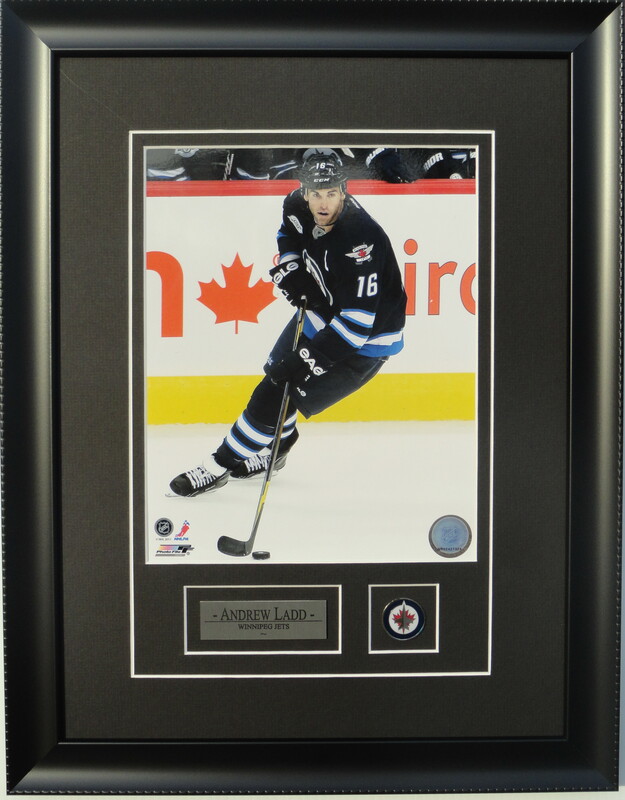 8 X 10 Photo frame of Andrew Ladd – Winnipeg Jets. Plate reads: “Andrew Ladd – Winnipeg Jets”. Authentic Winnipeg Jets primary team logo pin attached. Please contact for pricing. 8 X 10 Photo frame of Tobias Enstrom – Winnipeg Jets. Plate reads: “Tobias Enstrom – Winnipeg Jets”. Authentic Winnipeg Jets secondary team logo pin attached. Please contact for pricing.